Cordelia Maternity Camisole Pattern: On Sale Now!!!! It's here! 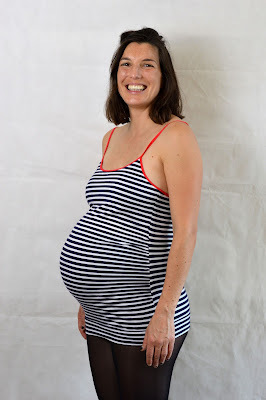 My latest PDF sewing pattern which has been designed to help women who are in one of the trickiest points in their lives to dress for: the third trimester of pregnancy! The Cordelia maternity camisole is a potentially invaluable addition to a maternity wardrobe. Suitable for wear in hot weather, as a layer in cooler weather, to sleep in or to wear to pregnancy yoga, this simple strappy top accommodates your bump with side gathers but feels super secure with a snug hem band. 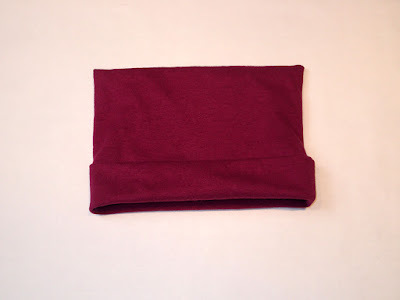 AND the pattern includes an optional bust support panel! 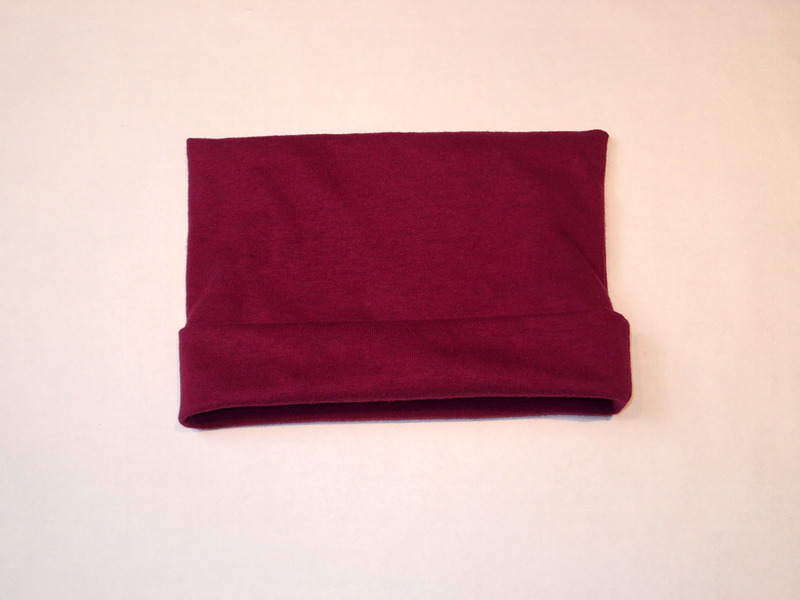 As a pregnant lady currently in the third trimester, I know first-hand how useful these camisoles are! During the heat wave the UK is having at the moment, a Cordelia camisole is pretty much the only thing I can stand to wear. In fact, I'm wearing one as I type this. This sewing pattern comes in a digital format. 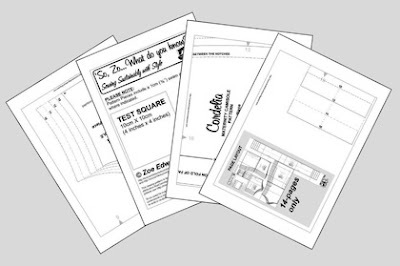 When you buy the Cordelia maternity camisole pattern, you will receive both print-at-home and copy shop versions of the pattern, the print-at-home version consisting of just 14 pages, as well as detailed instructions on all aspects of how to use this pattern and make the garment. The Cordelia maternity camisole pattern is suitable for almost all levels of sewing experience. 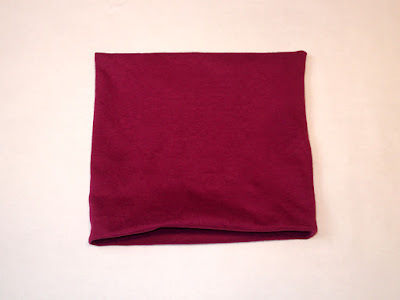 It is recommended that you have a couple of garment projects under your belt already, however the clear instructions include lots of tips for using both knit fabric and fold over elastic (which is used for the straps and binding the top edges) if those elements are new to you. A handy single-page version of the instructions has also been included for those with a lot of sewing experience, or as a reminder for when you make your second and third etc. versions. 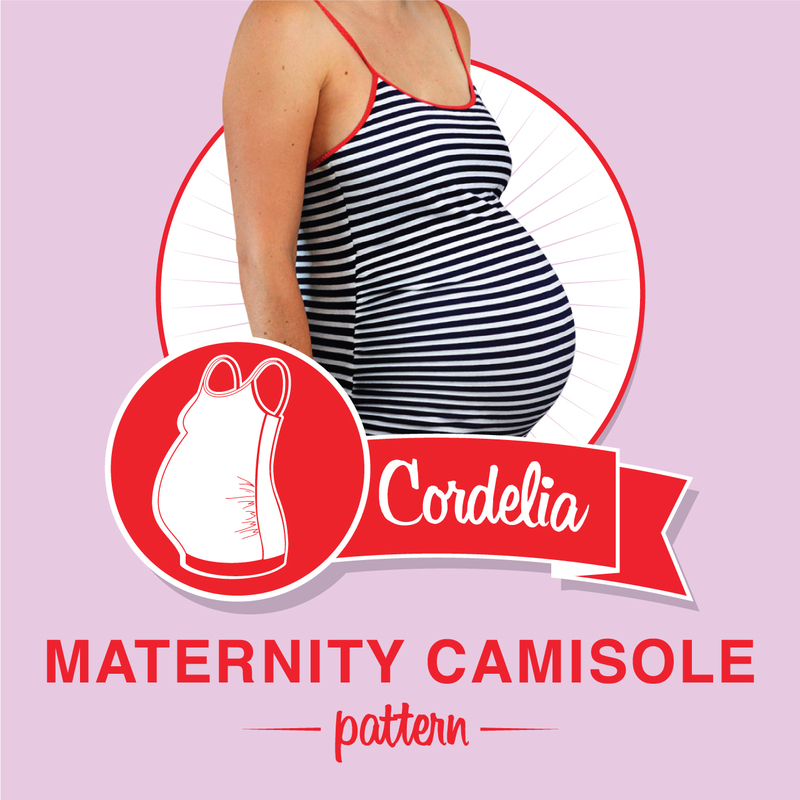 For further information, including how to purchase it, please head to the Cordelia Maternity Camisole page! Enormous thanks to Claire for all her help making this pattern into a product, both Cordelia and Sian for fit-modelling, and Cordelia for final product modelling also, a host of amazing pattern testers, and to Girl Charlee for sending me fabric to make samples from. I used their white stitched arrow on blue jersey (pictured above) and red and blue triangle stag jersey (pictured below). Ohmygoodness! SUCH exciting times. 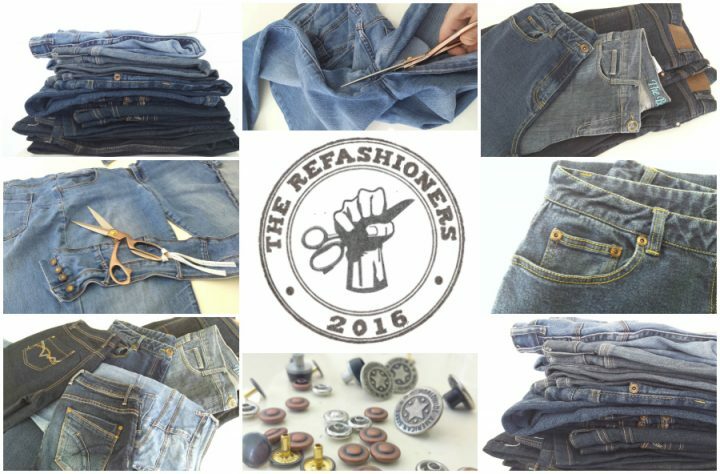 The Refashioners challenge, brain child of the wonderfully creative Portia, is back this year with a new theme: JEANS. A quick explanation: a selection of amazing sewing bloggers (and me) have been asked to refashion/rework/remake/reinvent some jeans, and their creations will be revealed on Portia's Makery blog throughout August. There is also a community challenge where anyone can submit a jeans refashion, and may well snag an ENORMOUS bounty of sewing-related prizes. My part in this challenge is pretty much done: I've refashioned my heart out and submitted my blog post and images to Portia. My post will appear with the rest at some point in August, but I'll blog about it and link to it over here once it's gone live in case you'd like to take a look. 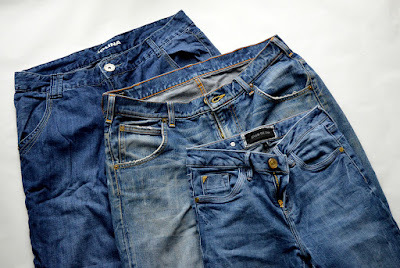 Obviously, those of us taking part in the blogger challenge are pretty much sworn to secrecy until our posts publish, but I don't think I'm spoiling anything by saying that the above three pairs of jeans don't look like that anymore! It's going to be beyond exciting to see what the other bloggers AND THEN the whole damn sewing community come up with. There's going to be some seriously interesting, creative and inspirational projects being shared, of that I have no doubt. The unwanted denim of this world is no longer safe! What about you? Are you going to be taking part in one form or another this year? Have you refashioned jeans before? What did you make and was it a success? Have you seen any other fabulous jeans refashions IRL or on the interwebs that've inspired you? 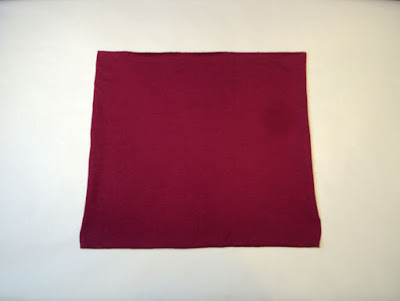 Step 1: Cut a rectangle of knit fabric (we used the Andover jersey knits in Peony) 42cm wide X 38cm high. Step 2: Fold the rectangle in half so that the shorter sides match up, with the right sides of the fabric facing each other. 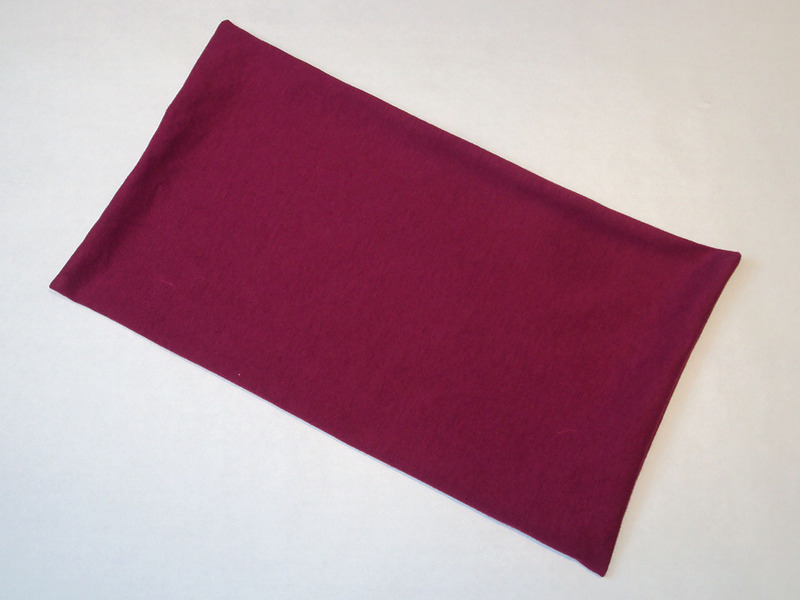 Pin round the three raw edges (there’s no need to pin the folded edge) whilst leaving a gap of approx. 6cm along one of the shorter edges (see the chalk marks in the image above). 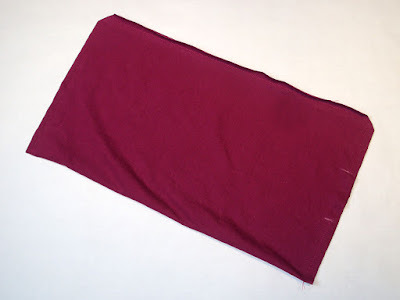 Step 3: Stitch round the three edges where you just pinned with a 1cm seam allowance. Pivot at the corners so you get nice sharp right angles (see image above). Don’t forget to leave that gap! 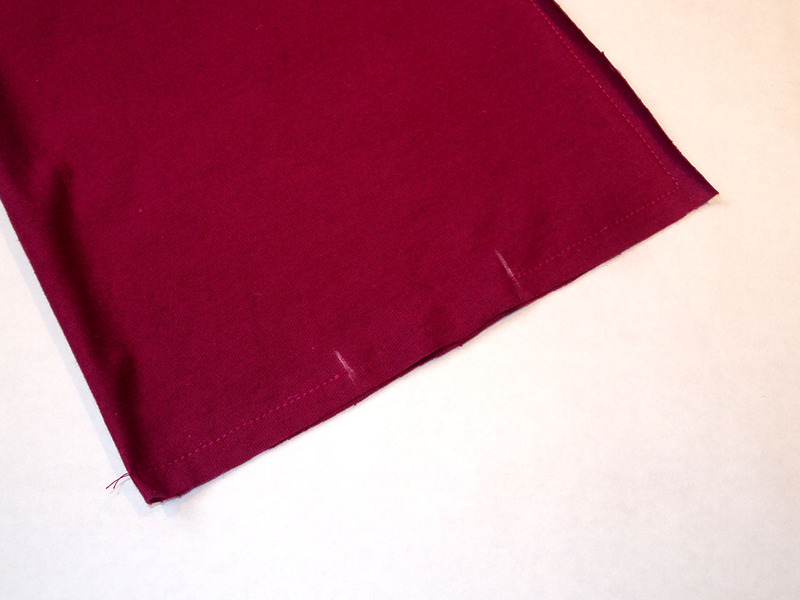 Step 4: Trim away the two corners where you pivoted to within 2mm of the stitching. Step 5: Turn the rectangle through the gap so that the right side of the fabric is now facing outwards. Use pin or something pointy to tease or poke the four corners out so they are nice and neat. 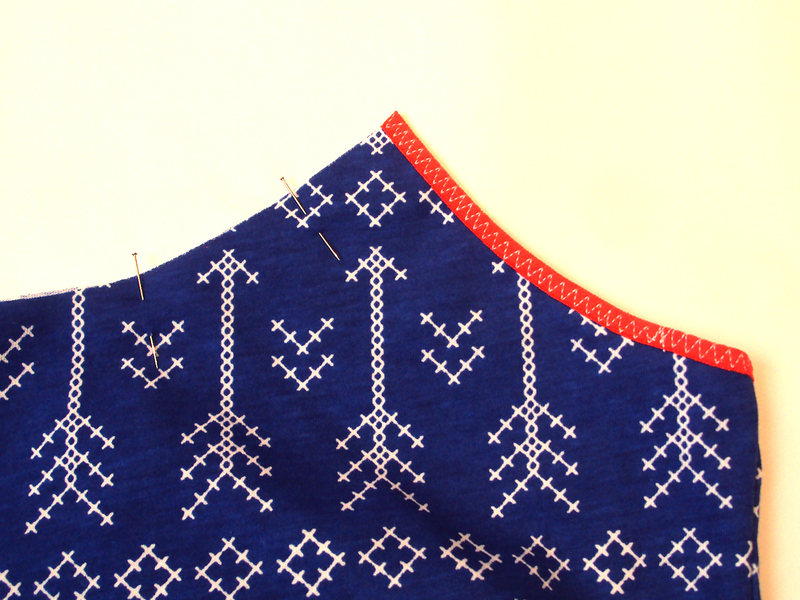 By hand, slip stitch the gap closed. Step 6: Push one of the short edges up inside to meet the other. 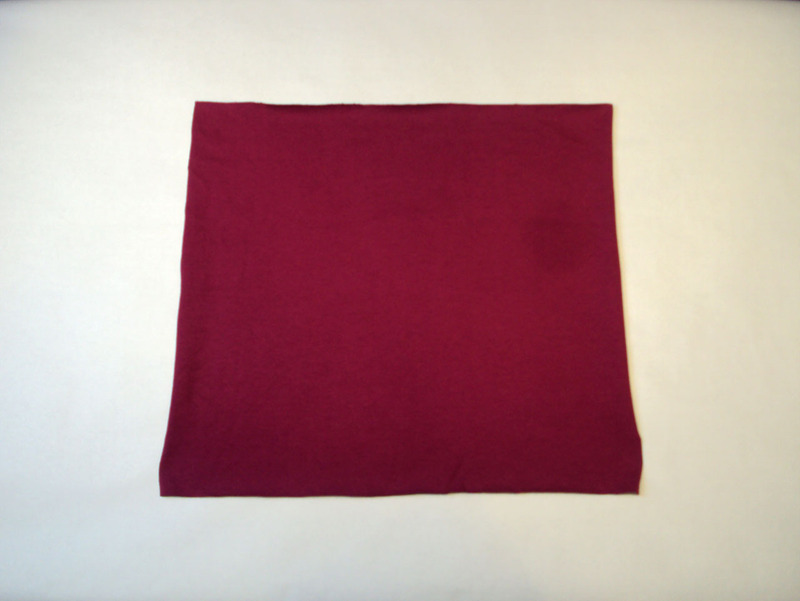 Step 7: Turn up the bottom edge to make a brim of approx. 4cm deep. 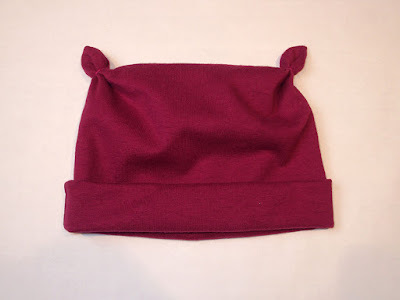 Optional: make a couple of stitches at either side at the top of the brim to keep it in place. Step 8: Pinch each corner to make ‘ears’. 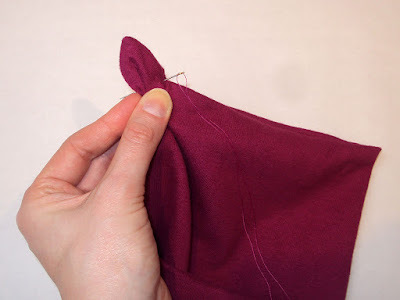 Push the needle through each ‘ear’ (see image above) then wrap the thread tightly round it a few times before knotting the thread. Ta daaaaaa! Now, quick, get to the baby shower or you’ll be late and there’ll be no cake left.